Why not add an overnight cruise to your self drive tour? 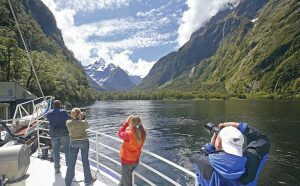 Or if you love the idea of discovering New Zealand from a different perspective, then we have several multiple night cruises covering the length and breadth of New Zealand. The vessel specifications for each cruise are listed on their respective cruise pages. The level of luxury onboard each vessel also varies depending on the cruise selected. Some of our cruise vessels are rated 5 star and others cater for the mid range market. We make it as clear as we can on each cruise pages to avoid confusion. Spaces on these cruises do fill up quickly over the summer period so we recommend booking early. Multiple night cruises only run on scheduled departure dates so you need to plan your holiday around the start date of the cruise you wish to book. We also have a range of overnight cruises in the Auckland, Milford Sound and Doubtful Sound that depart every day. Departure dates are sometimes cancelled if there are not enough travellers for the cruise to be viable, however Relaxing Journeys can check to see how viable the cruise date is and let you know before you commit to paying your deposit. Relaxing Journeys have a Price Guarantee in place that’s ensures you will not find a better price for your cruise anywhere else – in the world!